AFS has held several very cool events since I’ve started my exchange year in August. 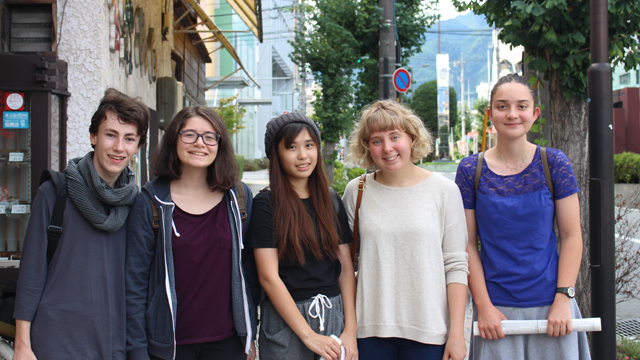 We have had the Orientation Camp at the beginning of my stay in Tokyo, and in September we had the Takato Camp. I won’t be talking about these events here, so, if you haven’t read them yet, go click the links and come back afterwards, there’s a lot of stuff here for you to enjoy. I will start this series with the Local Orientation, which was held oh so long ago. Did I mention this before? I think I’ve mentioned it before. AFS Nagano Nanshin is really very, very well organized. For each of the 3 events I am going to talk about today, we got an information sheet in advance [2 actually, one in English, one in Japanese, so everybody can understand everything.] I never had to worry about getting anywhere, as I would either go with my host family, or an AFS volunteer came to drive me. If I had to go by bus/train, people would be waiting at my stop. At lunchtime all students would get 500¥ as lunch money. There were never any problems and everybody always seemed to know exactly where they had to be and when. On September 25th 2016, Nagano Nanshin held a local orientation event in Iida-shi. As the summer students [being a student from Turkey and myself] had been in Japan for roughly a month, we had some time to go over everything and share our thoughts on our stay so far, and any concerns/problems we may have. This was held at a local restaurant, so it was good food and good advice. Probably in that order, the food was really, really good.All of the the exchange students are really good friends with each other, we’re like one big, weird, loving family. After all the series talk about health, school and phones [you know, what all series discussions are about…], it was time to go bowling, because that is always a fun thing to do. It turned out that just us five exchange students were going to bowl and all of the volunteers and host families were just going to sit around, chat, and watch. I really appreciate how AFS takes the time to make sure that everything is going smoothly, and that you are making the most out of your stay. You really gain a lot of knowledge through these orientations and I am so thankful that AFS holds them. All of the AFS volunteers are very kind and it is always very easy to talk or ask for help. I don’t think I ever mentioned this here before, but my LP [Liaison Person] called almost everyday for the first two or three weeks to check in and make sure everything is ok, and to inform me and my host family about events or information. She also very recently organized. in conjunction with my homeroom teacher, who also has done so much for me, that a university student comes to my school once a week to teach me Japanese after school. At the bowling hall they had tons of vending machines and arcade games [this is Japan we are talking about, I counted, on my commute to school, there are between 33 and 37 vending machines, just on my side of the street, just one way.] This bowling hall had an ice cream vending machine. Like many other vending machines here in Japan, this one had a mystery option, where, for a reduced price, the machine would randomly select one for you. When I tried this I got the most expensive one they had. It was very, very good. Also, for some reason, I managed to get way better scores while holding the ice cream in one hand and throwing the ball with the other. There is a picture of that somewhere, but no, you are not allowed to see it. It was really fun to just have a day to just have fun and goof around. Especially after a long debate tournament the weekend prior. I’ll write about debate club some day, maybe after nationals are over, I promise. There you have it, I decided to break this post up into several smaller ones instead of just one very long one about all of the events, because it makes it more organized and I can update more frequently. I actually started this post over a week ago but never had the time to sort through all of the photos. The probably busiest week I’ve had this year starts today, as it is the final prep week before Debate Tournament Nationals with club, and there is a lot to do. Of course that tournament is held December 24th and 25th. Christmas!